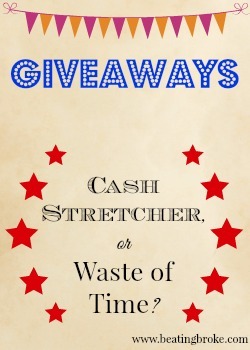 Giveaways: Budget Stretcher or Waste of Time? Giveaways are nothing new. Just read a handful of blogs and you’ll likely find plenty of giveaways. But are they worth the time and effort? Can you ever win something good? I’ll be honest, my husband and I are digging out of a hole of debt. The good news is that we’ve paid off over half of our debt. Yeah! However, we’ve reached a point where we firmly refuse to acquire any new debt. Meanwhile, our car is 10 years old and has 150,000 miles on it, our 10 year old needs braces, and we’ve just had nearly $2,000 in medical and dental work. . .
Our money is stretched to the max. So, I decided to try my hand at giveaways. Right now, we just don’t have a lot of extra money to pay for presents and fun items for the kids, so I thought giveaways could be a good way to get some of the luxuries we can’t afford. During these past three months, I entered 47 giveaways, meaning I won 10% of the giveaways I entered. Not bad. I don’t enter giveaways just to enter giveaways. Instead, I focus on ones that offer cash or gift cards (though these are the most competitive and difficult to win), ones that have products my kids would like or that would make nice gifts, and ones that offer homeschool curriculum. If you want to start entering giveaways, deciding what you would like to focus on winning is a good way to limit the amount of time you spend entering giveaways. To maximize my time entering giveaways, I try to enter ones that have low entries. I have found some Facebook groups to join where people advertise their giveaways. Another site I love is Tightwad in Utah. She lists low entry giveaways that are ending in the next week. If you’d like to enter giveaways and don’t really care if they’re low entry or not, you can use this link or this link to find linkies for giveaways from a wide array of bloggers. Finally, if there is a blogger who routinely offers the types of giveaways you’d like to win, make sure to come back and visit the site regularly. Chances are that entry requirements for the giveaway are to like the site’s Facebook or Twitter pages. Just do this once, and for every subsequent giveaway on that blog, you’ve already met those requirements. I don’t expect to get rich from entering giveaways or even to be able to supply all of my kids’ presents. However, it is nice to get free stuff in the mail, especially if some of it can be used to offset the expense of Christmas and birthday presents. Do you enter giveaways? Why or why not? If you do, how much success have you had? How much time do you spend entering giveaways?